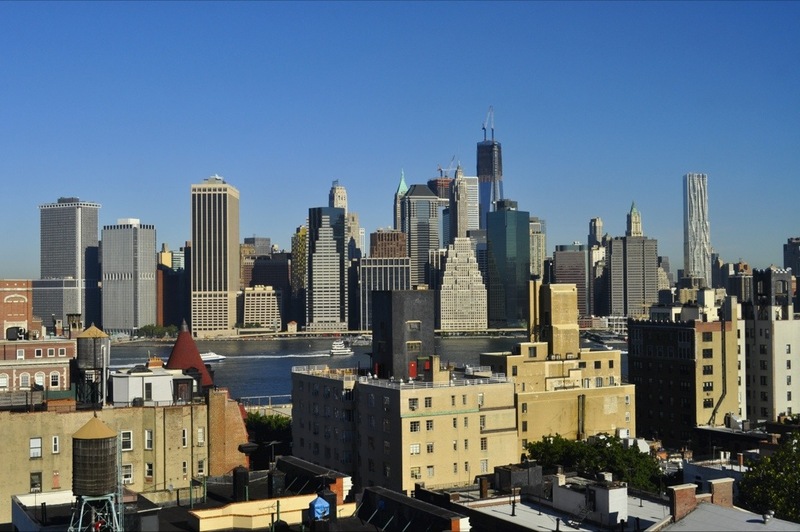 It’s another day, and here I am in wonderful New York City. I arrived Wednesday evening in Brooklyn Heights at the beautiful Bossert Hotel. 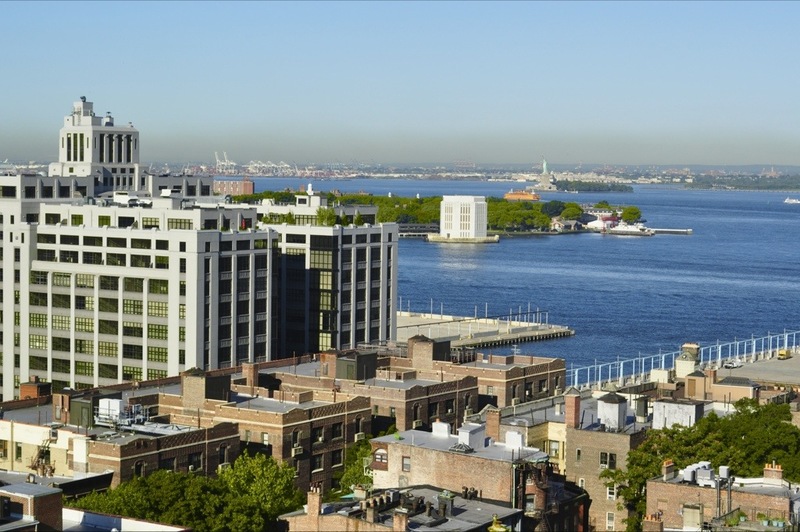 Here, we have absolutely gorgeous views of the Manhattan skyline and the Statue of Liberty. Yesterday, I came 1/4 of the way closer to a dream. As some of you know (or maybe don’t), I am a huge tennis fan. So that means that 4 times a year, I try to adjust my sleep schedule to catch as much as the Grand Slam finals as I can (US Open, Australian Open, French Open and Wimbledon) on TV. But it’s my dream to actually attend all 4. 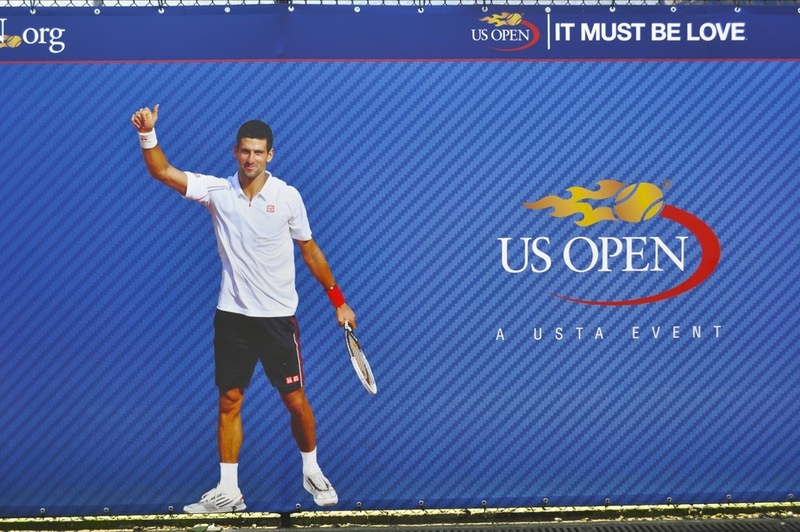 And yesterday, I took the first step by attending the US Open in Flushing Meadows, NY. The energy was palpable from the moment I stepped in. 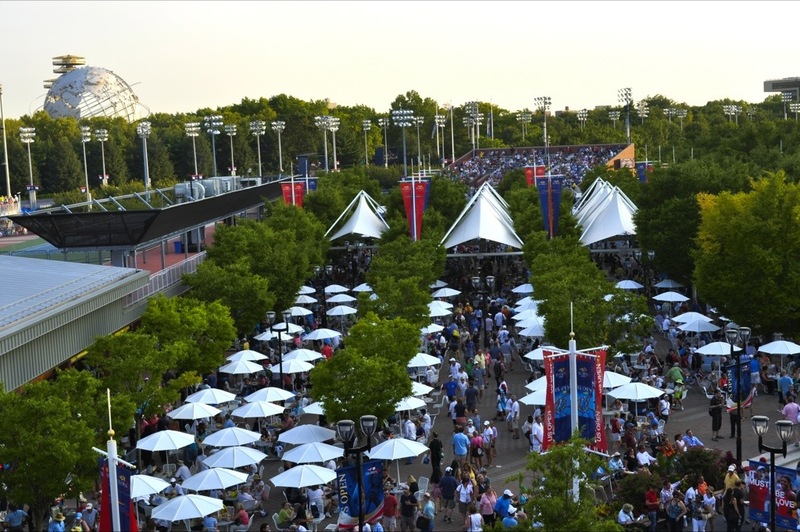 As I overheard someone saying yesterday, tennis is a more dignified, elegant sport, as this is reflected in the fans and the hospitality shown once entering the premises. As we walked in, workers greeted us with a “Welcome” and a smile. My ticket allowed me admission to all courts except for the large Arthur Ashe court. Which means that I didn’t get to see the Williams sisters play (though as I’m not a huge fan, this wasn’t the biggest lost). What I did get to see, however, was a lot of players in the 19 other courts at a much more intimate level. The first game I saw was at Court 17, played by Serbian Jelena Jankovic. At one time she was one of the top 5 ranked women in tennis, unfortunately injuries have made her slip to #30. However, I’ve always admired her style and determination. Since this was one of the smaller courts, I was actually able to sit front row court side, literally just feet away from the players. I soon realized that I was also sitting near Jelena’s box, and could hear encouragement in Serbian and English coming from her coach and friends. After this awesome match, I was really looking forward to seeing the Tsonga-Klizan match. The Frenchman Tsonga is currently ranked #5 in the world and always fun to watch. Unfortunately, today he was literally just not on his game. His errors made the game kind of a bore, and I left after one set to have an overpriced lunch and watch him lose on the big screen. After lunch, things started to get really crowded and I tried unsuccessfully to get into a couple of more games. 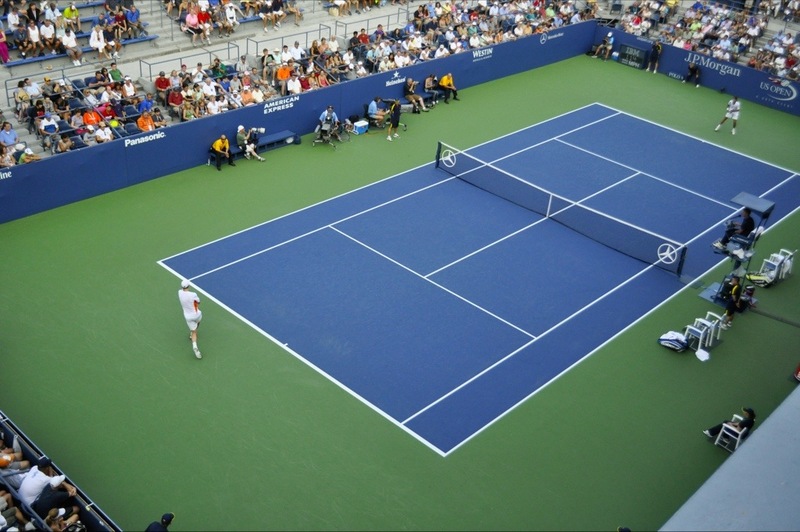 Except for Arthur Ashe Stadium, the courts are first-come-first-served and they only let more people in while the players are changing sides. Therefore, it can mean a bit of a wait to get into a court. However, after my unsuccessful tries, I was able to get into the Grandstand Court (the 3rd largest court) to see #2 ranked Radwanska from Poland come from a one set deficit to beat Suarez Navarro of Spain. 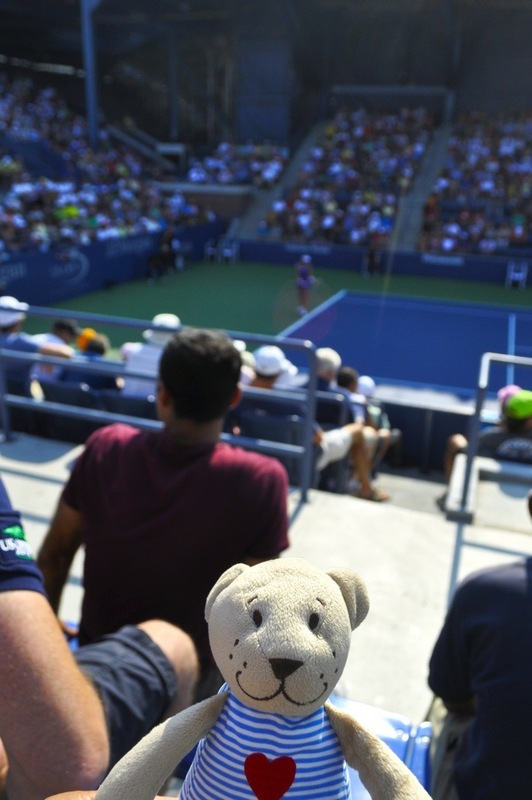 This game had a lot of great rallies, but unfortunately the mid-day sun was getting to me, and I had to leave mid-match to seek some hydration. If any sport needs stadium vendors hawking drinks and food, tennis does, but I guess it would be too distracting for the players. Therefore I had to leave the stadium to seek my $5 Evian water (total rip-off). A little aside – as I was walking to get water, I saw a man in the broadcast booth that looked very similar from the guy from LMFAO. “Nah,” I thought. “What would the guy from LMFAO be doing at the US Open?” Well, today I found out that that really WAS the guy from LMFAO and apparently he’s a big tennis fan, plays and coaches a girl in the Junior Leagues. Go figure. 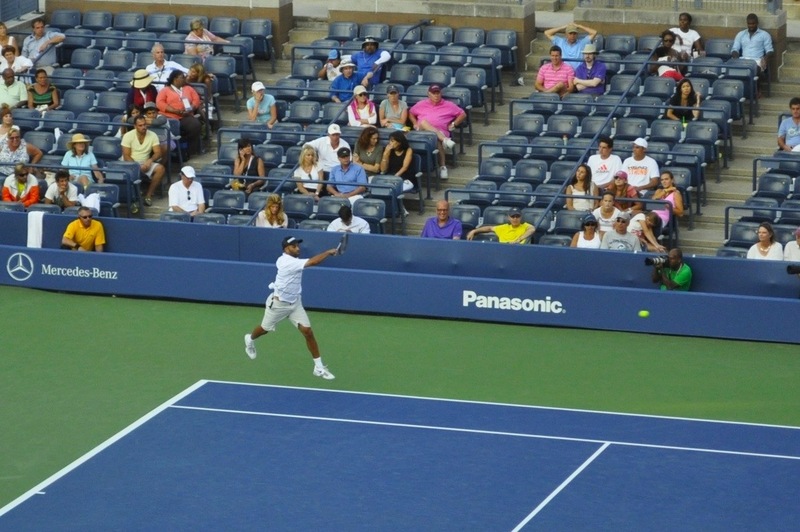 Back to tennis – after being properly hydrated, I got to catch 3 Americans play. 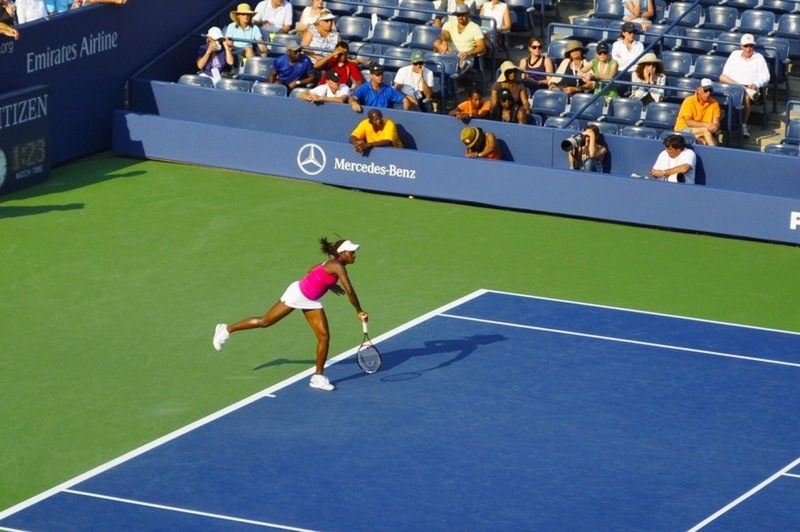 First was 19 year old Sloane Stephens, an up and coming womens’ tennis player. The funniest thing about this was the ongoing commentary throughout the game by 3 guys behind me. Although she did not play her best game, she definitely had the home crowd behind her and came off with the win. US Men Sam Querrey and James Blake followed suit. 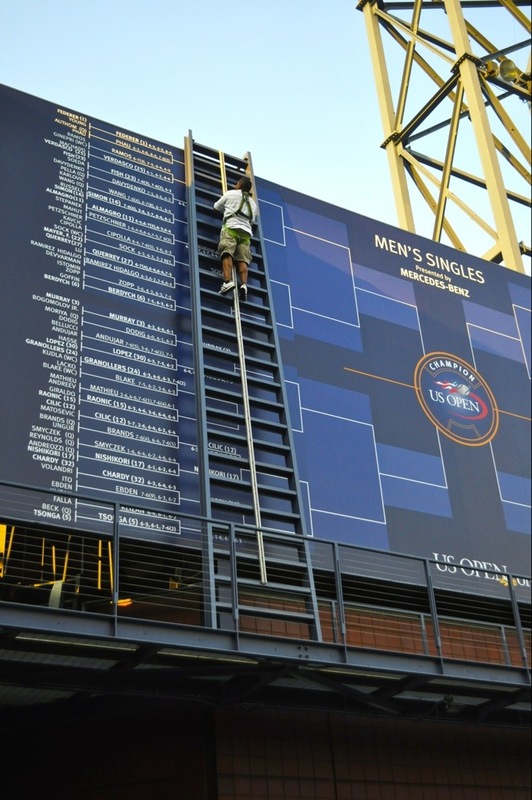 Updating the players’ bracket. Good thing this guy doesn’t have a fear of heights! 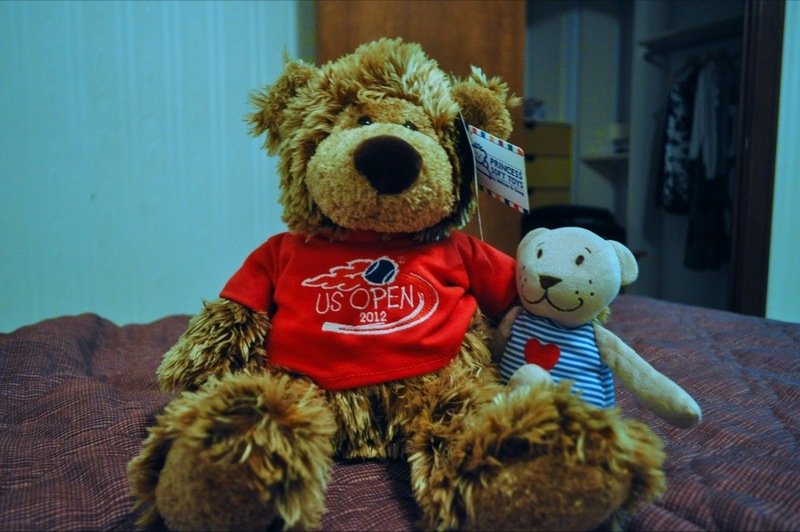 After a LONG hot day at the Open, I met my mom along with Frenchie and his French friends in Manhattan. We walked a bit to get my Shake Shack fix and introduce the Frenchmen to New York’s best fast food burger chain. 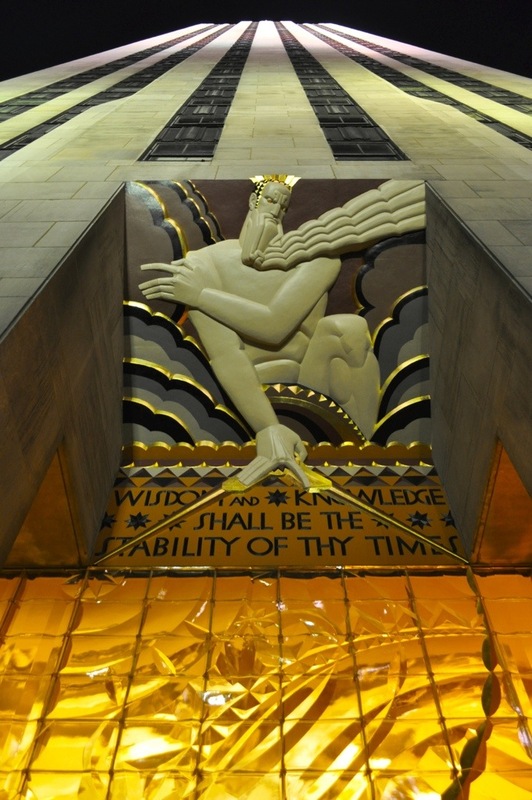 Along the walk, we got to show them Times Square and Rockefeller Center. Oh, and by the way, Boo got a big brother…. News fr home, counted 15 reg pios now w/ the add of the 6 new pios this month. You guys going out in service in NY at all? Well look forward to your next blog. You must be running day & night…. I’ve actually been spending this time mainly resting! Which is nice. Miss you too!